Yes, it’s true. I’m a Gleek. A huge one, too. But I’m not alone. There’s many of us. We are legion. We are loyal. And we love to throw Glee parties and drink mojito slushies. In fact, we had one such occasion this past Tuesday at the house of my fabulous friends, Brian and Rita. We had a potluck dinner, complete with chicken marbella (delicious), quinoa (delicious), homemade bread (delicious), a corn-feta salsa (supremely delicious), more potato and corn chips than is probably healthy, homemade wine, the mojitos (of course) and these zucchini sticks. Chase signed up to be the taster for this particular recipe experiment and he approves. I’m in fact going to order a stamp that says “Chase Approves” and use it accordingly. Seriously. Well maybe not seriously. But maybe seriously. How much do stamps cost anyway? 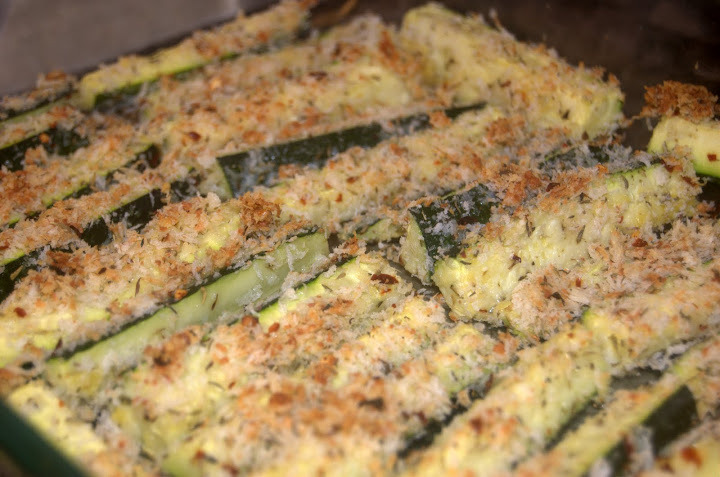 This was a Parmesan zucchini recipe that I found originally on Cooking Light and then adapted a bit. It makes a good appetizer, crunchy, delicious, and in there underneath the awesomeness and the bread crumbs is a vegetable. So that counts towards your daily 5. Just FYI. And these are in fact so easy that I just prepared the parts of the recipe at home, brought it all to Brian’s and then assembled and baked them there. About 5 minutes of prep, 20 minutes of baking and that’s all there is to it. 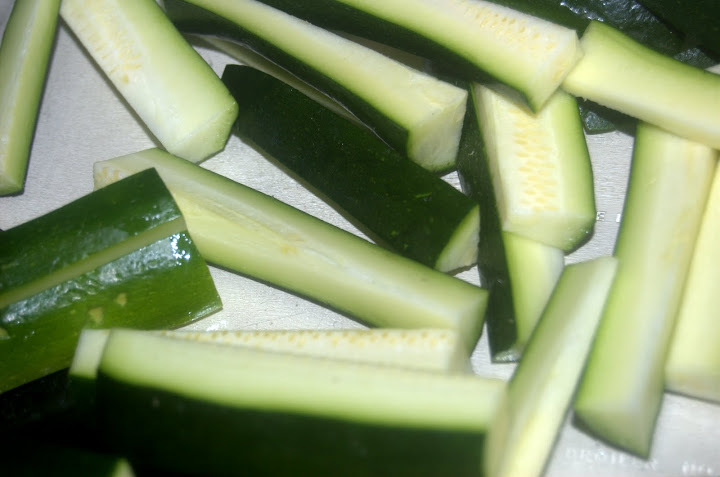 Cut each zucchini in half cross-wise and then cut each half into 8 sticks. Combine panko, salt, pepper, oregano, red pepper flakes and Romano cheese in a medium bowl. 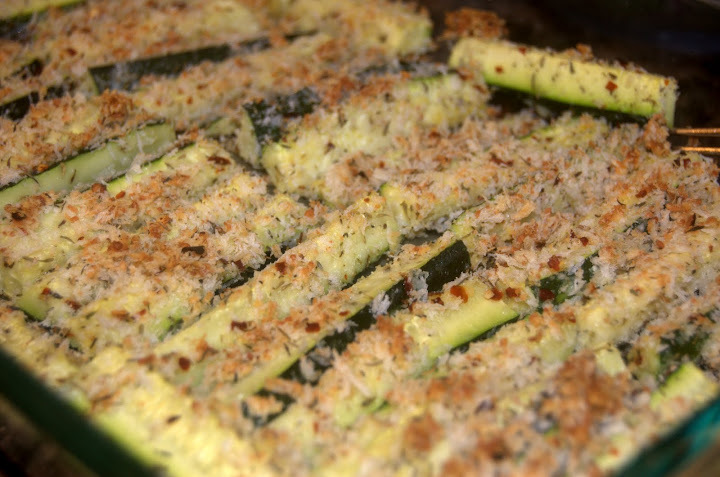 Dip the zucchini sticks first in the egg, letting the excess run off, and then dredge in the panko mixture, pressing as much of the mixture into the sticks as possible. Place sticks side by side on a large baking sheet that’s been coated with cooking spray. Bake for 20-25 minutes or until browned and crispy. Serve! Eat. Share. This entry was posted in General Musings and tagged appetizers, sides, vegetables, vegetarian on May 30, 2010 by Lauren. Foodie, blogger, instructional technologist and the Evernote Ambassador for Home Cooking. If you are what you eat, then I want to be delicious. If I ever get eaten by a zombie, I want it to feel like it was worth the chase.